Keeping your home cool shouldn’t require worrying about little fingers, paws and noses around fan blades. Not to mention the dust collection that fan blades accumulate and blow across the room. 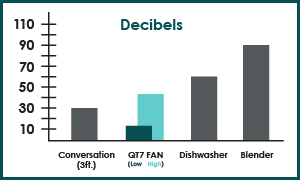 pureFlow QT7 brings the security of a dust-free bladeless breeze that keeps any room cool and comfortable. Circulate air throughout the entire room with its unique 90 Vertical Tilt and 90 Horizontal Oscillation, keeping the air flowing in every direction. Uniquely designed to cycle air more quickly than traditional fans, keeping your room temperature consistent and comfortable. Everything about this fan is designed to reduce power usage and increase airflow. Using as little as 2 Watts it can provide twice the circulation speed and coverage of a normal fan. Provides a safe alternative to traditional bladed fans because of its bladeless cooling design, allowing for use around children and pets. Simple control panel and included remote control allow for fan speed and oscillation adjustments from the comfort of your seat. Keep calm and leave the fan on using the convenient auto shut-off timer that operates for up to 9 hours. 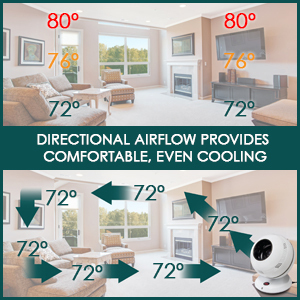 A unique combination of 90° horizontal oscillation and 90° vertical tilt brings a stream of steady and strong airflow into your room at any angle that you choose. Move cooler air directly to the ceiling by tilting the fan straight up. Use the fan from floor level by tilting it up to seat or standing level. Use as a desk fan and keep it at seat or tilt to standing level. Circulate air throughout the entire room on oscillation mode. 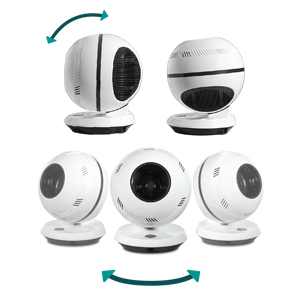 Direct airflow to one specific space by turning oscillation mode off. Customize your comfort with 12 individual fan speed settings, offering airflow from a gentle breeze to a full gust of wind and everything in between. ONLY 13 DECIBELS ON ITS LOWEST SETTING & QUIET ENOUGH FOR A LIBRARY ON ITS HIGHEST SETTING. 7 TIMES MORE AIR VOLUME CREATES MORE COMFORTABLE, EVEN COOLING. ACHIEVE BETTER PERFORMANCE WHILE SAVING 80% ENERGY USING AS LITTLE AS TWO WATTS. "In a hurry and want the best? Well, you can’t go past the pureFlow QT7 Bladeless Fan. Featuring good strong air movement, and a maximum noise level of 43 decibels this fan is sure to impress. I remember when I saw my first bladeless fan…sure, it looks fancy – but it didn’t really do all that much. Well, I am glad to tell you that is certainly not the case with the pureFlow QT7 bladeless fan. 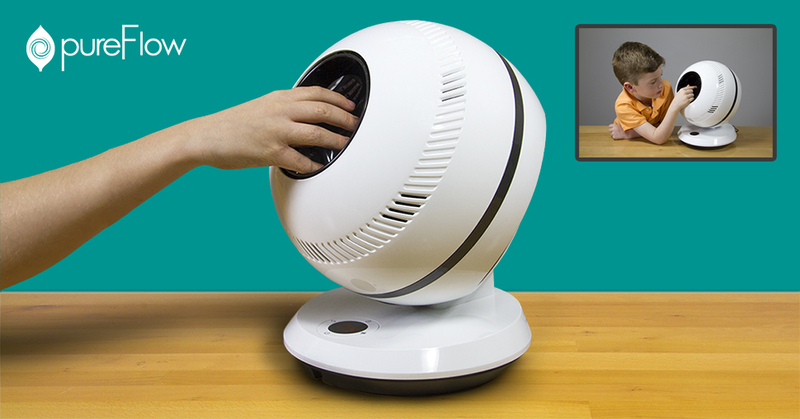 Not only is the quietest fan on our list that still moves a decent amount of air, it is also packed full of features. All at a reasonable price. 12-speed settings mean that it is easy to find a comfortable setting, from a light breeze to a strong gale and everything in between – this fan does it all! 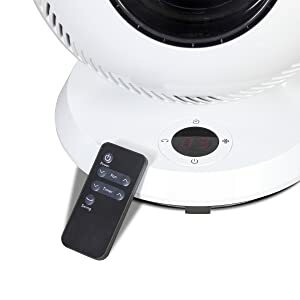 We found this fan especially good at circulating the air in a room when in oscillation mode, without having air blowing directly on us – freshening up the room amazingly. The footprint of this fan is tiny, it sits happy on a desk, shelf or even on the floor. And because the QT7 is bladeless, there is no need to worry about little fingers being injured. As far as fans go, this one is also amazingly energy efficient. It will barely cost you anything to run it – even at full speed. As of yet, we have found no downsides to this fan – it’s not easy to impress us as much as this fan does!" “I live near the beach in southern Alabama where it is hot all of the time. I keep this fan in my kitchen because that’s where I spend most of my day. If is the perfect size for my space and I’m amazed how well it circulates the air. It’s surprisingly not too loud. Even on the higher settings. Keeping it clean is my favorite part. I love how I don’t have to worry about cleaning any fan blades. Just a quick wipe and I’m done! I’d recommend this fan to anyone!" "I’ve been interested in bladeless fans for some time now because I have two small children that get into everything. I just don’t want to have to worry about them sticking their fingers inside and getting hurt by the fan blades. But the other bladeless fans I’ve found online either had terrible reviews or were crazy expensive. So I was thrilled to find QT7, although I was hesitant that it would work as well as it said it would. Boy, am I impressed! It moves a ton of air, it’s quiet, and the oscillation is so nice. My kids actually sit and play with it throughout the day! Excellent product! I plan on buying another for my bedroom as well." "We love our QT7 fan! We used it outside camping a few weeks ago when temperatures and humidity were high and it worked great! It produces an unbelievable amount of air for its small size and it’s very quiet." "We have a QT7 fan and we love it! It takes up less room than a traditional stand fan is much more quiet. My teenage daughter loves it and all of her friends want one because it looks so cool. I love that it’s bladeless because my dogs get really close to it." "I live in a tiny apartment with three other girls and it’s already gotten hot this year, so I got QT7 because it actually fits right into the look of our place. Now that I’ve had it a couple weeks I can say it’s perfect for our small apartment. It has 12 different fan speeds to choose from, so we can adjust it depending on how hot it is each day. I also like that I can tilt it to the ceiling so we can keep cool without having the air blowing right at us"
"My mom got me the QT7 fan for my dorm room. I wasn’t sure at first if I would like it but as soon as we started moving in, the fan came out because it was so hot that day. The breeze felt so good and I love how it rotates side to side and you can tilt it up and down. I feel like it reaches the whole room and fortunately my roommate loves it as much as I do. Plus, it looks so different than any other fan. I get compliments on it all the time!" "I love the tilt function so I can point the fan up when it’s sitting on a lower surface. The air actually gets out to the whole room that way!" "I got this fan because it looks so unique - almost like something out of a sci-fi movie or something. And it works pretty great, too." "This fan is awesome! I need a fan in my room at night and this one doesn’t keep my husband awake because it’s so quiet. It’s like the perfect amount of white noise. And it doesn’t have that weird ticking noise when it rotates like most fans do." "I have a two-year-old and a newborn. I use the fan in my living room, especially when I’m trying to put my baby asleep. It makes the room so much more comfortable and it’s so much quieter than any other fan. Plus, when my two-year-old is playing on the floor near it I know she is safe from fan blades." "I use QT7 in my cubicle at work and love it. It’s a nice gentle breeze - not choppy like other fans. Everyone in my office loves it." "Quiet, tons of different speeds to choose from, and having a remote is nice. I love the interesting look of it. It fits easily on the top of my side table and works well. My kids always come home from school and sit down next to it to cool down for a while. They love it." "It cools my room without annoying blades and noises. And it looks cool. Definitely worth the money." "The output is incredible. Fantastic for white noise." ""I love my pureFlow bladeless fan. It's small enough to fit right into my living room and it is so powerful. Quiet and efficient, and so easy to keep clean compared to my old fan. Highly recommend!" "This bladeless fan is great! So much power for such a little fan and also very quiet. I love how it is safe for my curious 3-year-old! It also has a great modern feel! Highly recommend!" "Like the fan, a lot of air for how small the device is. Covers a lot of area. It works well with all of the settings."